When our children were young, the saying developed, “because Mama said.” It was the answer to many issues. So, one girl would say to another girl that it was time to come in to dinner. The inevitable answer seemed to be, “Why?” But, the magic winning riposte was when girl one would answer girl two by saying, “because Mama said.” Somehow, Papa’s word never quite carried the same weight. That continued into the teenage years. The phrase was shortened to simply, “Mama said.” For instance, “Mama said for you to stop taking my clothes without permission.” In later years, the now-grown-up sisters laugh as they recall, “Mama said.” It must be admitted that, to this day, “Mama said,” still has the power to both make us laugh and to cause a pause before deciding whether to follow the advise or not. Mama still has power. The Bible has a classic Mama story, the story of a grown-up child interacting with Mama after Mama has decided that something needs to happen. You know the story. 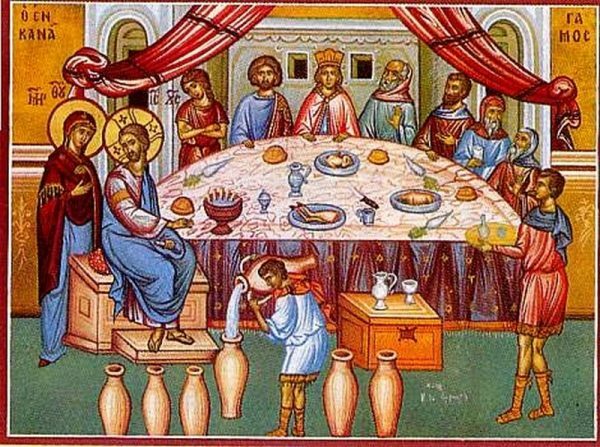 It is the Wedding Feast at Cana. Yes, the classic story involves both the Theotokos and Our Lord Jesus Christ. And, yes, it is a classic. Mary wants Jesus to do something. Almost like a teenager, an apparently exasperated Jesus says that it is not time for him to begin his ministry yet. I can almost see the eye-roll that appears to be involved. He argues with his mother that she is wrong.